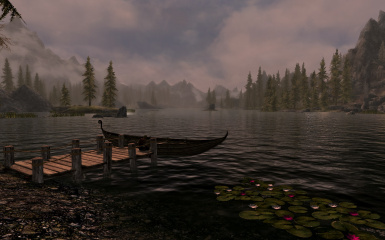 A lightweight overhaul of both the vanilla Skyrim carriage system and Dawnguard's ferry system. Realistic and bug-free. If you want to upload this mod to another site, ask me first. If you want to use assets from this file, ask me and I can make them available to you. You can use them as you please. You can edit this mod for personal use, but don't upload it as your own. If you're making a translation, ask me first. If you want to upload your translation somewhere else you must make it available on Nexus as well. If you've been given permission to translate any of my mods, assume it means permission to translate all of them. You don't need to ask again. Please send me the link to any translations that you upload anywhere else. Drowsy, Astakos and Crashpilot for reporting bugs. Insane0hflex for the mod spotlight video. Edited the companions rescue mission quest to specifically exclude disabled drivers. Fixed a subtitle for Whiterun's lore dialogue, previously fixed by USLEEP but not forwarded to new dialogue entry "and Battle-Borns" -> "and the Battle-Borns"
Renamed incorrectly named script "KmodFerryIlinataMarker.pex" -> "KmodFerryIlinataScript.pex"
An overhaul of both the vanilla Skyrim carriage system and Dawnguard's ferry system. Designed to make ferries a viable means of travel, make prices realistic based on travel distance and add loads of cut carriage dialogue. A lot of mods do this already, but I was never really happy with any of them. The biggest problem with mods like this is bugs and instability, so I've kept this mod simple and stable. There are no background scripts, no navmesh edits and as few cell edits as possible. Scripts have been tested repeatedly to make sure they're as efficient as they can be, and there are no known bugs. Ferries operate on the north coast, Solstheim, Lake Ilinata and Lake Honrich. Scroll down for a complete list of destinations. You can build a jetty and hire a ferryman at Lakeview Manor and Windstad Manor. A ferryman is also available for Honeyside. Ferries are slightly cheaper than carriages, but only offer destinations on the same waterway. They also offer some destinations that carriages do not. Previously they cost the same price, so there was no reason to use them - carriages were superior in every way. No more buggy ferry seats - after paying the ferryman you will be transported after a few seconds. You don't need to "use" the horrendous, glitchy "ferry seat" activator. To preserve realism, ferries do not offer routes that would involve going up or down waterfalls. 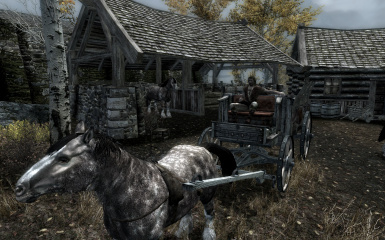 Carriages have been added to Falkreath, Morthal and Dawnstar. Different carriages use different breeds of horses, they're not all plain brown anymore. 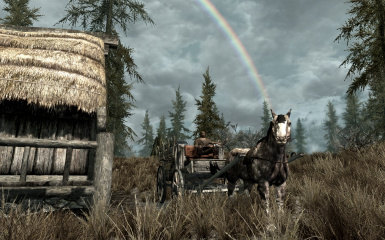 Carriages will take you to any settlement in Skyrim. When you ask to hire a carriage, you'll be presented with a list of nearby locations (usually within the current hold). You can also ask to be taken to any of the other 8 holds, in which case you'll be presented with a list of their settlements. Hearthfire homes are included as destinations (provided you own the house). Prices are roughly based on the length and danger of the journey. 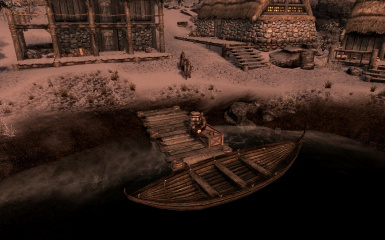 For example, from Whiterun a carriage to Riverwood is only 40 gold. To Falkreath it would cost 60 gold. To Winterhold it would cost 80 gold. You have to pay for a carriage before you can use it. If you change your mind, you can ask the driver for a refund. If you wait too long, you'll lose your money. All prices can be customised using SSEEdit, but cannot be changed once you have made a save with the mod installed. Scroll down to "customisation" for instructions. 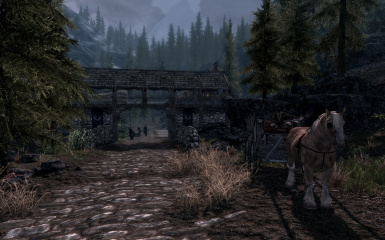 Although part of Whiterun hold, Riverwood is also considered local to Falkreath, and so is charged the local price tariff by the Falkreath driver. 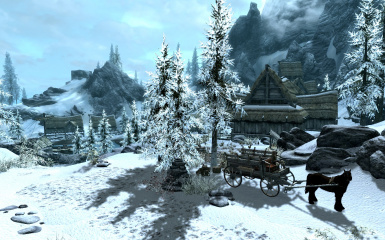 Although a capital, Winterhold is charged at the higher price tariff due to its remote location. Personal carriage and ferry operators do not charge any fee for transport. The ferry system consists of major stops and minor stops. At a major stop, a ferryman will be available to take you to any destination. A minor stop (italics) is a location at which you can be dropped off, but no ferryman is available to take you anywhere else. 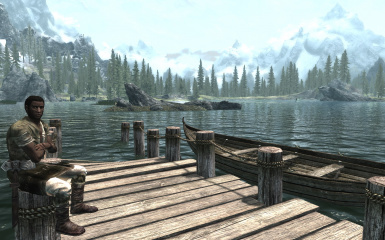 At the Hearthfire homesteads, building a jetty will make the location a minor stop. If you want to travel from your home, you need to hire a ferryman by talking to your steward. You must have built the jetty before you will be able to hire the ferryman. At Honeyside, purchasing the house itself will make it available as a minor stop. Purchasing the porch upgrade will give you the ferryman. 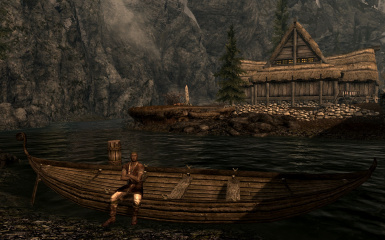 Icewater Jetty is not available until you have spoken to the ferryman about the "Island to the west of here"
* Hearthfire homes are available as destinations as soon as you have purchased the land from the Jarl. If you had already bought it, you will have to purchase the carriage at your Hearthfire homestead again after installing CFTO. 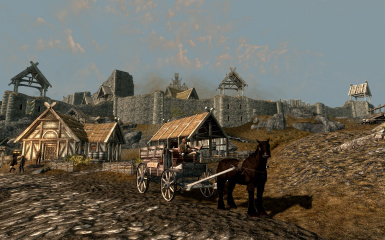 Fully compatible with Expanded Towns and Cities (ETaC) and Dawn of Skyrim. 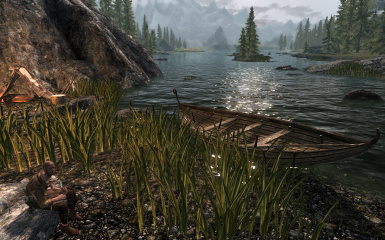 A patch is available for JK's Skyrim. The carriages added to Falkreath, Dawnstar and Morthal should be compatible with most other settlement overhauls. 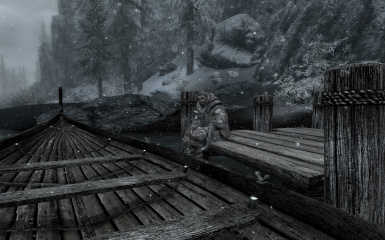 The ferry at Dawnstar has been moved closer to the city and given a jetty. Where possible, new ferry stops use an existing jetty to maximise compatibility. 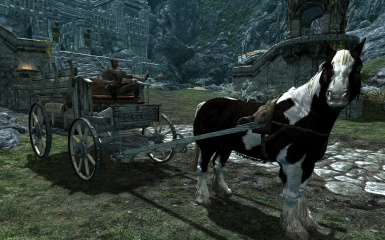 The Dawnguard quest "Prophet" has been adjusted to refer to the new carriage drivers instead of the vanilla ones. Carriage horses no longer raise the alarm when you are sneaking out of a city and guards are looking for you. To preserve realism, carriages will drop you off at the road nearest your destination. In most cases this is within the settlement itself, but in some cases the settlement will be a few paces away. Ferries will drop you off at the nearest waterway to your destination, which is usually the town/village's port. Not all patches are available yet for the Special Edition Version of this mod. 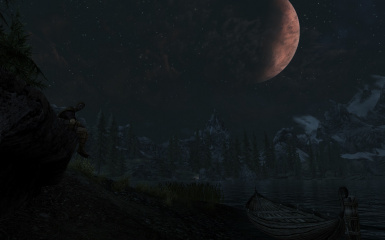 Some of the patches for classic Skyrim are no longer relevant as SSE versions of some of these mods do not exist. If you find a conflict and you are sure what that conflict is, please report it in the bug tracker. Hearthfire Extended patch - merges steward dialogue from HFE and CFTO so that you can purchase upgrades from both mods. Inconsequential NPCs patch - restores carriage guards added by Inconsequential NPCs. Does not add new carriage guards. Does not fix any actual bugs/conflicts. You may safely decide to go without using this. 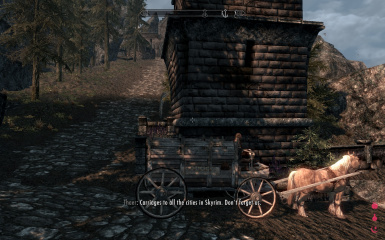 JK's Skyrim patch - Removes a cart in Morthal that was clipping with CFTO's carriage. 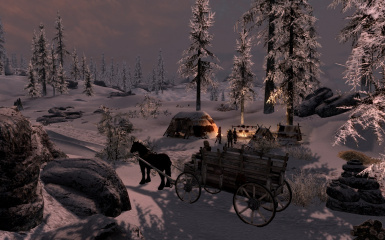 Moves CFTO's Dawnstar carriage out of JK's Dawnstar wall. 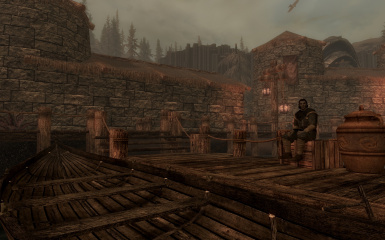 Removes CFTO's Dawnstar jetty and moves CFTO's ferryman to JK's Dawnstar port. Moves CFTO's Ivarstead ferry and ferryman to JK's Ivarstead port. JK's Towns patch - Identical to JK's Skyrim patch, but rebuilt for JK's Towns. JK's Cities does not require a patch at all. If you find another mod that conflicts with CFTO please let me know and I will build a patch for it too. Carriage horses don't always position perfectly against their carriage. This is a vanilla bug, but is made more noticeable by some of the lighter coloured horses. Attacking a carriage horse may cause it to run away. It will have returned after you leave and reenter the cell. Until it has returned, you will not be able to travel using the carriage and will probably be arrested for damaging property. Realistically, the bolting horse would take the carriage with it, but just assume it broke free somehow... Personally I think this is more realistic than the horse standing there as though nothing happened. 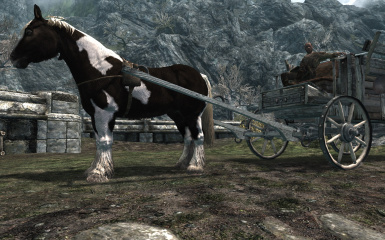 During the Dawnguard quest "Prophet", a carriage driver says "he wanted to go to Dragon Bridge, but I told him that wasn't one of my stops". With this mod installed, it now actually is one of his stops. Once you've saved a game using the mod, price values are stored in your actual save file and cannot be changed. The reason I'm not adding an MCM is because most people will only ever change these prices once, if at all, so it's not worth adding background scripts and an SKSE/SkyUI requirement for. KmodFerryVolikhar - Do not edit this. It is not used to determine pricing. KmodCarriageDestination - Do not edit this. It is not used to determine pricing. My Hearthfire carriage is gone! You need to buy it again after you install the mod. Another mod is overwriting CFTO's changes. Any mod that affects carriage drivers must be loaded before CFTO. Another solution is to disable one of the drivers using the console (NOT markfordelete). Make sure you keep the driver who offers all the new locations - only one of them will, the other driver will not work at all. Save your game, then load the save. This is the Creation Kit dialogue bug, and is common with all mods that add dialogue. I see no dialogue option to hire a ferryman or carriage. First, make sure you're not experiencing the CK dialogue bug (see the previous question). Otherwise, it's possible that you're using a Hearthfire mod that edits steward dialogue (such as Hearthfire Extended) and don't have a patch. If there's a patch, use it. If not, try adding the temporary Hearthfire mod patch to the end of your load order. Please leave a comment letting me know what mod you're using it for so I can release a proper patch! The temporary patch will disable the changes to steward dialogue made by any other Hearthfire mod you're using. You can remove it once you've hired the ferryman and/or carriage. Since installing this mod, <Mod that edits Hearthfire> isn't working. 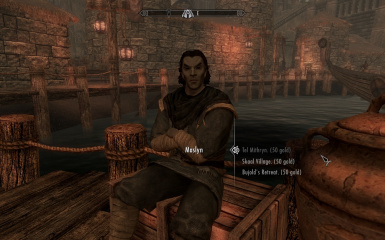 You're using a Hearthfire mod that edits steward dialogue (such as Hearthfire Extended) and don't have a patch. If there's a patch, use it. If not, ask me to make one. 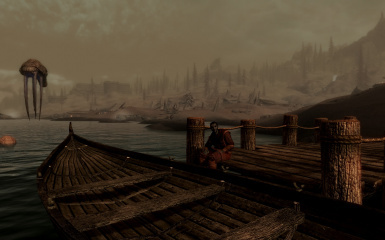 Dawnguard adds the dialogue used by the ferry operators. 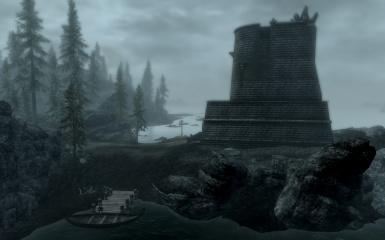 Without Dawnguard, there would be no ferry system to overhaul. Please let me know so I can make a patch! What's the difference between the Heljarchen and Nightgate versions? 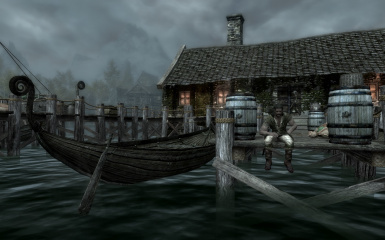 Nightgate Inn was originally intended to be the village of Heljarchen, but Bethesda cut it down to just an inn. Cutting Room Floor restores the rest of the village and renames the location back to Heljarchen. If you're using Cutting Room Floor, it makes sense for the names to match. I think perhaps ETaC and some other mods do the same thing. In any case, none of these mods are actually required so you can pick whichever version you prefer. 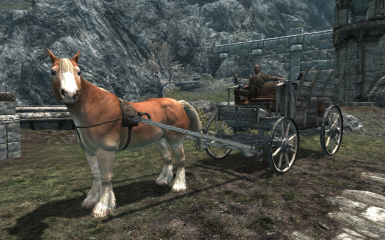 Please add carriages to every settlement in Skyrim. 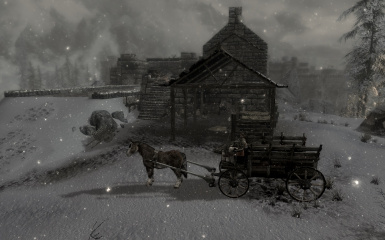 I want to keep the mod realistic, and if a settlement consists of nothing more than a few small farmhouses then it wouldn't make sense for them to have a 24hr carriage service. I might add some new carriages to carefully selected locations, but I'm not going to go adding them everywhere. Please add an MCM to customise prices. I may add an MCM later, but I'm not going to add one just to offer price customisation. Most players will only need to customise prices once, if at all, so it's not worth me forcing an SKSE/SkyUI requirement as well as background scripts on all of the other users just because a few users don't want to have to use SSEEdit. Please add <mod added location> as a destination. I'll be adding lots of mod-related destinations soon, so please leave a comment letting me know what location you'd like to see made available. 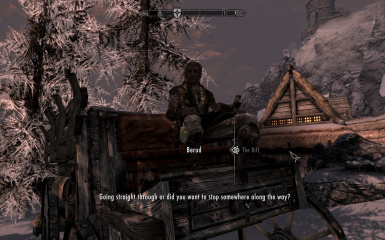 Does this mod disable normal (map-based) fast travel? No it doesn't. I might add an option to later, but in the mean time there are other mods that do this already. 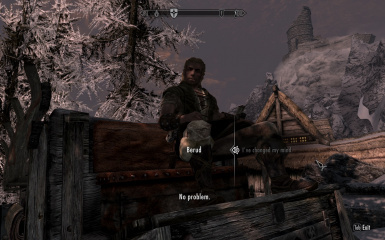 Frostfall has an option in its MCM, and there are some other mods that exist solely for that purpose. You could also just... not use the map to fast travel? Cleaned with SSEEdit. No bad records, no further cleaning required. Using Hearthfire Extended? Remember to use the patch. This file shares some scripts with my other mod, Hearthfire Extended. Allow them to overwrite each other, the scripts are identical. These errors result from CFTO suppressing the vanilla carriage system. They will not be the cause of whatever issue you are investigating. Uninstall the other mod, load your game and create a new save. Don't worry if carriages are missing completely - CFTO will take care of this automatically once it's installed. Carriages should then return and work as intended. 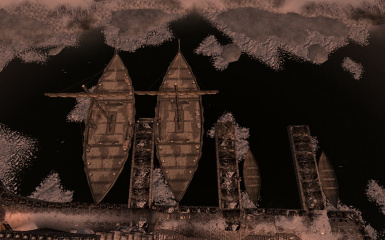 You can still use the ferry only version alongside any of these mods! They only conflict with the full version. JK's Cities - Confirmed. Patch not required! JK's Cities Lite - Confirmed. Patch not required! While "Better Fast Travel" does not conflict with CFTO, I do not recommend you use it since it has not been updated recently and has many issues. CFTO is intended as a replacement for BFT, and incorporates most of its features. If you can confirm whether any other mod is compatible or not, please leave a comment to let me know.